From the author of the Inspector Montalbano series comes the remarkable account of an exceptional woman who rises to power in 17th century Sicily and brings about sweeping changes that threaten the iron-fisted patriarchy, before being cast out in a coup after only 27 days. Sicily, April 16 1677. From his deathbed, Charles III's viceroy, Anielo de Guzmán y Carafa, marquis of Castle Rodrigo, names his wife, Doña Eleonora, as his successor. Eleonora de Moura is a highly intelligent and capable woman who immediately applies her political acumen to heal the scarred soul of Palermo, a city afflicted by poverty, misery, and the frequent uprisings they entail. The Marquise implements measures that include lowering the price of bread, reducing taxes for large families, re-opening women's care facilities, and establishing stipends for young couples wishing to marry—all measures that were considered seditious by the conservative city fathers and by the Church. The machinations of powerful men soon result in Doña Eleonora, whom the Church sees as a dangerous revolutionary, being recalled to Spain. Her rule lasted 27 days—one cycle of the moon. Based on a true story, Camilleri's gripping and richly imagined novel tells the story of a woman whose courage and political vision is tested at every step by misogyny and reactionary conservatism. Andrea Camilleri is widely considered to be one of the greatest living Italian writers. His Montalbano crime series, each installment of which is a bestseller in Italy, is published in America by Penguin Random House. Several books in the series have been New York Times bestsellers. His literary honors include the Nino Martoglio International Book Award. Born in Sicily, Camilleri currently lives in Rome. "[Camilleri's] sly, wry approach to matters of morality, politics, crime and sexual dynamics seasons a stew of facts and fiction to perfection." "Suspense, surprises, and courtly intrigues abound in this story of power that also doubles as a tribute to women and their sensibilities." "Camilleri is back! This time with a novel that is entertaining, moving, and written in his hallmark and hypnotizing mix of Sicilian dialect and standard Italian...The Revolution of the Moon is, above all, an homage to women. Eleonora di Mora is both courageous and fiercely determined. More than a book, this is another jewel from Andrea Camilleri placed in a historical setting that feels tragically similar to our own." 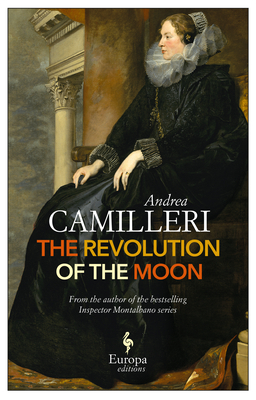 "Based on a truly captivating moment in history, Camilleri shows us how a woman triumphed over remarkable obstacles and, in the face of ceaseless scrutiny, how she proved to the world that she was as unwavering as the brightest moon." "Eleonora, a woman forgotten by history, will come alive to the reader. I highly recommend this book to anyone who wants to discover a remarkable, forgotten woman."